Earlier this morning at PAX East, Blizzard announced a new single player campaign for their breakout free-to-play card battler game, Hearthstone: Heroes of Warcraft. The new mode is called “Curse of Naxxramas" and takes place in an ancient necropolis of the same name. This will be the first bit of single player content for Hearthstone (not counting the game’s brief tutorial or practice rounds against the AI). Using your deck of choice, you’ll need to fight your way through each wing of the floating, dead city, cutting through the rotting horde before facing special new boss characters. 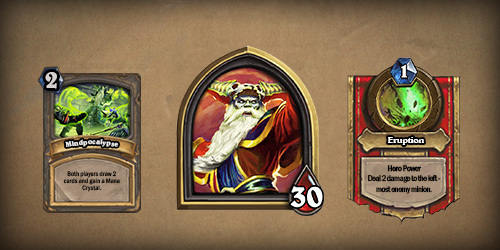 According to Blizzard’s announcement, these bosses come with their own unique cards and abilities. Heigan the Unclean, for example, uses and Eruption ability that damages the left-most enemy minion, while the Mindpocalypse spell allows both players to draw two cards and gain two mana crystals. All told, the new mode will introduce 30 new cards, a new game board, and 9 challenges specifically designed for each of Hearthstone’s different characters. These new cards will also be worked into the Arena—where players must build a deck using random cards—even if you haven’t unlocked them all yet. A side note from someone who’s put in a bit of time on Hearthstone for Mac: the new cards on Blizzard’s website put a heavy focus on Deathrattle mechanics. With the right combination of minions, it looks like you’ll be able to trigger a huge chain of buffs, summons, and extra card draws if any of them die. If there are any cards like that in vanilla Hearthstone, I haven’t come across them. Finally, the “Curse of Naxxramas” will be released in five parts, one for each of the ancient necropolis’ sections. The first wing of the dungeon—the Arachnid Quarter—will be free for all Hearthstone players, but subsequent campaigns will need to be bought with either in-game gold or real money. The “Curse of Naraxxus” will be released simultaneously for PC, Mac, and iPad later this year, but Blizzard haven’t announced specifics yet. Meanwhile, we Americans are still waiting with baited breath for any whisper of a release date for Hearthstone on iPad while quietly glaring at our Canadian, Australian, and New Zealander comrades. Reach for the Stars in Froggy Jump 2! Hop from one platform to the next in this Froggy jumper! Rush to the sky with Icarus! - Collect Rush Power and fly high! - Unlock various wings and costumes! Bike Assault - High Speed Moto Drive Chase! Survive the jungle and chase the Ark! Rogue Heroes is fast-paced 2D action-platforming game with RPG elements. Bring Color to this World! Featured in US Store! The most epic action game for you. Float around as a cloud in a little town. Put out fires, and turn your frown upside down. Welcome to CLOUDYTOWN! !